Upgrade the style of any room in your home when you visit our showroom for wood flooring in Marrero, Louisiana. With our selection of hardwood flooring options, you are sure to find the perfect pattern and material to transform the look of your space. Shop Acadian Flooring America to explore our extensive collection of stunning options –we also provide professional hardwood flooring installation for each of our products. When you are looking for an easy way to create a warm and comfortable atmosphere in your home, consider the luxury look of wood. This sophisticated floor choice never goes out of style. From living rooms to kitchens, it delivers a regal style throughout every room of your residence. Once you have selected the perfect hardwood flooring for your space, don't rely on an installation from an inexperienced installer for your project. Without professional equipment and knowhow, your installation may lead to extensive problems in the future. Without the proper installation, you will end up dealing with flawed floors and could spend extra in avoidable repairs. Our team of experienced contractors is available to perform your hardwood flooring installation in any room. We complete your job correctly the first time, ensuring that you enjoy a luxurious and inviting atmosphere throughout your home. Whether you are trying to sell your home or you just want to make a worthwhile investment, choosing stunning wood floors will help you accomplish your goals. Adding solid wood floors to your space helps increase the value of your home. This eye-catching option is a popular feature for homeowners and potential buyers alike. With all of the things you have to do during the day, worrying about the cleanliness of your floors should not be one of them. In addition to retaining a natural beauty, our hardwood floors are also easy to maintain and upkeep. There is no need to worry about a vigorous cleaning schedule. Dust and dirt is simply mopped away! Have a problem with allergies? Try wood flooring for a healthier environment. 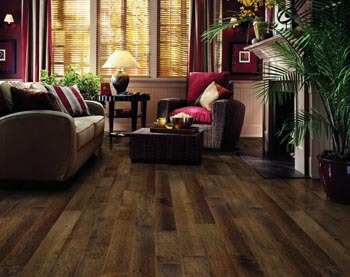 Make the smart investment for your home when you choose to install a new set of wood flooring. This durable flooring material is built to last. It is designed to hold up to regular wear and tear for years to come, proving its worth. A strong material, it is perfect for high-traffic areas and works for most rooms throughout your home. To help your wood flooring last even longer, we recommend taking the best possible care of it not, while it is still new. Follow the manufacturer's cleaning instructions and remove your shoes to prevent scratch marks, scuffs, and other issues. Always a classic look, solid wood flooring will look great no matter what color or grain you select. It matches virtually any design scheme in the home. At our local showroom, we offer a full stock of products. Visit us today and choose from a wide variety of wood choices and grains to outfit your home. Whether you like light or dark hues, our extensive stock is sure to have something for everyone. With all of the options on the market, many homeowners find it to be difficult or stressful to select the right wood flooring style for their needs. A member of our team is available to help you throughout the selection and installation process. We meet with you and discuss your design preferences, wants, and needs. With our assistance, you'll be able to choose the perfect patterns for every room. Contact our team today to learn more about our selection of wood flooring. We proudly serve the communities of Marrero, Westwego, Avondale, Harvey, and the New Orleans Metro area of Louisiana.